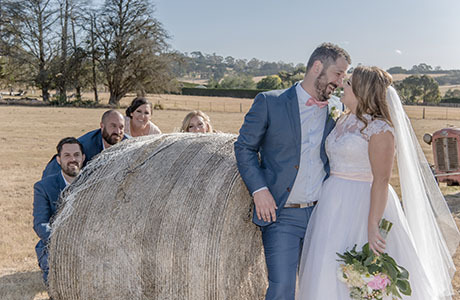 Set in the foothill of the Mount Macedon Range, Glen Erin at the Lancefield is an ultimate wedding venue for your Country and Rustic Wedding. With the capacity up to 250 people, Glen Erin offers a complete wedding venue solution which includes the wedding ceremony, receptions and accommodation for your wedding day. If you prefer to have a dream wedding ceremony outdoor, the alfresco ceremonial dais of Glen Erin is a perfect place for you. The backdrop of the vineyard and gardens can definitely make you and your guest enjoy the natural beauty of a Glen Erin wedding. When the weather turns bad or you prefer to have an indoor ceremony, the newly renovated feature chapel will be another perfect option. For the reception, Glen Erin has the options of a sit-down dinner, buffet and cocktail menu for you and your guest. The award-winning team will make sure the food quality and individual need to be satisfied. Glen Erin also offers amazing accommodation on site for you and your guests. The 4.5-star luxury king bedded room will guarantee you preparation start smoothly and the whole day running stress-free. From a Melbourne wedding photographer’s view, Glen Erin is a truly fantastic wedding venue for a candid and winery wedding. Should you have any questions to plan a wedding at Glen Erin, please do not hesitate to Contact Us for the suggestions and information from a wedding photographer’s perspective.